Smoke from the Carr Fire hangs over a section of the Sacramento River in Redding, viewed from the Sundial Bridge. California’s wildfire season is getting longer and more intense, with smoky skies becoming a regular hazard throughout the state. How do I know what the air quality is for my area? 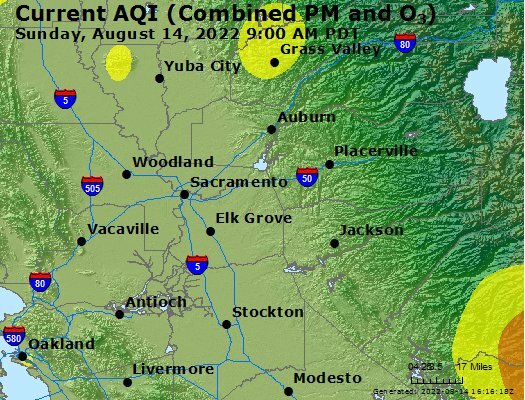 Each day it’s smoky outside, you should check the air quality index (AQI), either at Sacramento’s Air Quality Management District website or the Environmental Protection Agency’s site, airnow.gov. That will tell you if there’s an unhealthy amount of pollution in the air where you live. The AQI is usually calculated based on five major air pollutants: ground-level ozone, particle pollution, carbon monoxide, sulfur dioxide and nitrogen dioxide. Each is measured and weighted differently and reported on a common scale — the AQI. In the U.S., these air quality measurements range from 0 to 500, with 500 being the most harmful. Any measurement below 100 isn’t likely to affect your health. Above that, sensitive groups may be at risk. Measurements above 300 are considered hazardous to all. Why doesn't the AQI match what I see? Sometimes air quality measures may not seem to match what we can see when there is heavy smoke or even ash in the air. One reason is that smoke and haze can be visible in the air even if it's not at ground level, says Thomas Wall with the Sacramento Air Quality Managment District. "That's one are where we see folks who look at current conditions and may see it looks OK, but it's gross looking and dark outside," Hall says. "That doesn't necessarily mean that pollution is at the ground level." Still, Hall cautions that there can be big differences in air quality even between neighborhoods. While checking local air quality measures is a good first step, use caution if you can see or smell smoke. "If you're smelling smoke you're definitely breathing it," Hall says. "It doesn't mean necessarily it's unhealthy, but it's a good indicator it is." How does breathing in wildfire smoke affect your health? Wildfire smoke contains a complex mixture of organic chemicals including carbon dioxide, carbon monoxide and hydrocarbons, plus water vapor, particles, nitrogen oxides and trace minerals. The main concern with smoke is “fine particles” — tiny bits of matter that you can inhale deeply into your lungs. Those fine particles can affect your lungs and your heart. They irritate your respiratory system, and exposure to high concentrations can cause persistent cough, phlegm, wheezing and difficulty breathing — even for healthy people. Studies have also found that short-term exposure to these fine particles over days or weeks can aggravate pre-existing heart and lung disease. Not everyone exposed to smoke will experience health problems. Different factors determine individual susceptibility — including your age and whether you have pre-existing lung or heart conditions, like asthma, COPD or heart disease. Most healthy people will recover quickly from smoke exposure, but “sensitive groups” (we hear this term a lot) may experience more acute or longer lasting symptoms. Experts say that “sensitive groups” include children, elderly people, pregnant women and anyone who has a pre-existing heart or lung disease. "If you are somebody who already suffers from a heart or lung condition, it can definitely make you feel much sicker," said Lori Kobza, Sacramento Metropolitan Air Quality Management District spokesperson. "You can get an increased shortness of breath, heart arrhythmia, it can cause heart attacks in people as well." Anyone with pre-existing health conditions should check with their doctor if they experience symptoms from the smoke. What should “sensitive” people do when the air quality is poor? If the air quality near you is poor, stay inside with the doors and windows closed and limit your physical activity. During exercise, your air intake increases, which brings more pollution deep into the lungs. Experts say staying inside and reducing physical activity can reduce exposure by at least a third or more. You can also upgrade your air conditioner filters, or buy a portable air cleaner. If you have a central air conditioning system in your home, set it to re-circulate or close outdoor air intakes to avoid drawing in smoky outdoor air. Other options to get a break from the smoke include going to public libraries, hospitals, movie theaters and other public buildings with good HVAC systems. If conditions are going to be bad for a long time, you might consider going to stay with a friend or family member where the air quality is better. Masks can be helpful, but you should reduce your exposure in other ways first — namely by reducing activity and staying indoors. Can Short-Term Exposure To Wildfire Smoke Impact Long-Term Health? Experts Are Researching Answers. Scientists lack conclusive answers, but studies indicate children and older people with health conditions are more vulnerable. Smoke from the Camp Fire in Butte County continues to linger over Sacramento, but there's been debate about free breathing masks being given out by the city. Experts say they won’t be harmful to most people, but aren’t necessary, either. Smoke masks. Eye drops. No outdoor exercise. This is how Californians are trying to cope with wildfires choking the state, but experts say an increase in serious health problems may be almost inevitable for vulnerable residents. While the city of Sacramento has been handing out masks to the public to guard against smokey air, county health officials say the risks actually outweigh the benefits. The city is also giving masks to unsheltered people and is urging everyone, especially seniors and young children, to stay indoors. The Camp Fire has forced tens of thousands of people in Paradise, Concow and other small communities to evacuate, according to Cal Fire. The fire claimed a significant number of structures and injured firefighters and civilians. California is witnessing more and more red flag warnings. But what is a red flag warning? And how much precaution should you take if you live in an area under a warning? No major wildfires are burning near Sacramento, but a dull haze and faint smell of smoke has still blanketed the capital region for two weeks due to distant blazes. Pet expert Gina Spadafori has advice on how to help your pets during wildfire season. Wildfires put a lot of emissions into the air at the same time as California is trying to reduce them, but scientists are unsure about a fire’s carbon footprint. PG&E said outages are either related to damage caused by the fire or are precautionary outages requested by Cal Fire in anticipation of fire behavior. In this week's News Network, Jennifer Scarborough of KRCR TV and Jeffrey Parker of KZYX Mendocino Public Radio tell us about covering destructive wildfires burning in their communities. Cal Fire Deputy Communications Director Mike Mohler updates us on the wildfires burning throughout Northern California, including the Mendocino Complex and Carr Fires. Fire crews have stopped the forward progress of three fires that broke out Wednesday afternoon in the foothills east of Sacramento. Dense smoke from a series of wildfires burning in California has triggered air quality alerts across more than a 400-mile stretch of Nevada from Reno to Las Vegas. In the five days since the Carr Fire began in Shasta County, it has burned more than 80,000 acres, destroyed more than 300 homes and killed at least five people. Scientists have long known that wildfires pollute the air with soot and other fine particles that are dangerous to human health. But as a new study shows, particle pollution from wildfires is much worse than previously thought.